Fueling for a long day on trail can make or break the outcome of your hike. As you can imagine, I’m pretty intentional about giving my body what it needs to succeed, especially when I’m undertaking a physically stressful endeavor, such as hiking 40+ miles with 11k’ of elevation gain in a day. This post covers my Rim to Rim to Rim (R2R2R) nutrition strategy. 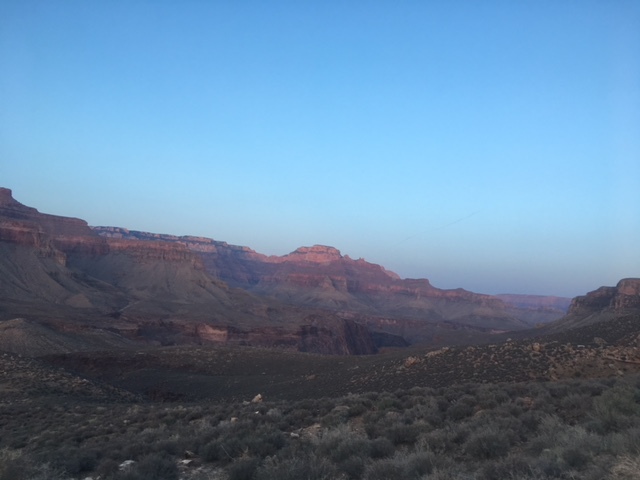 If you’re interested in reading a full account of my hike, please see this post, where I discuss the gear I wore/carried as well as details from my day of hiking in the Grand Canyon. What follows is a list of what I ate during my day of hiking R2R2R. Of course, how I eat, move, sleep, etc. on a daily basis has a greater overall impact on performance than what I do in one 24 hour period, but for those interested, here’s how I approach fueling a long day of hiking. I’ll also explain a bit about why I chose what to eat and why I chose to eat it when I did. The intention is to provide insight into how I eat for endurance and lasting energy, and hopefully you can take some tips away to use on your own adventures. 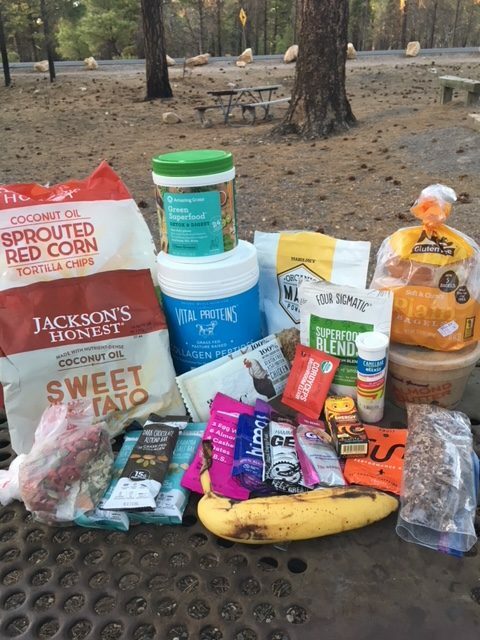 This photo provides a general idea of the food I brought with me to the Grand Canyon, from which I would choose what to carry on my R2R2R hike. I didn’t take all of this and I only carried a serving or two of the items pictured in bulk (e.g. the greens powder, the protein powder, the almond butter). Some of it I didn’t take at all (e.g. the bagels and the coconut chocolate). To determine how much to carry, I used calories as the primary metric. Because I wanted to be sure I had plenty for an over-nighter should I need to stay in the canyon, I carried a bit extra, and aimed for ~4,000 calories. Here’s approximately what I ate and when, followed by an explanation of why. 5am: 3 scoops Vital Proteins Collagen Peptides + 1 scoop Trader Joes Organic Maca Powder + Four Sigmatic 10 Mushroom Blend + 1 scoop Amazing Grass Superfood + 1 spoonful almond butter (my favorite is Natural Grocer’s fresh ground… so fluffy and creamy) + 12 oz. strongly brewed Puehr Tea. Supplements taken with breakfast: 1000 mg Vitamin C, Selenium, Zinc, Omega Complex and Cellular Vitality Complex (found here, search lifelong vitality pack). Whatever time you choose to break your fast (breakfast), it’s arguably the most important part of the day, nutritionally speaking. I started the morning with 30 grams of protein and a healthy fat, as I often do, whether on trail or off. This breakfast is satiating, so I don’t have to think about fueling again as quickly, and it also boosts leptin, a hormone which decreases appetite and leaves me feeling more satiated for the rest of the day. I find that having a high carb/high sugar breakfast puts me on an insulin roller coaster of sugar spikes and crashes. High carb breakfasts cause me to be hungry an hour later, after the sugar has worn off, and I find myself craving more carbs. 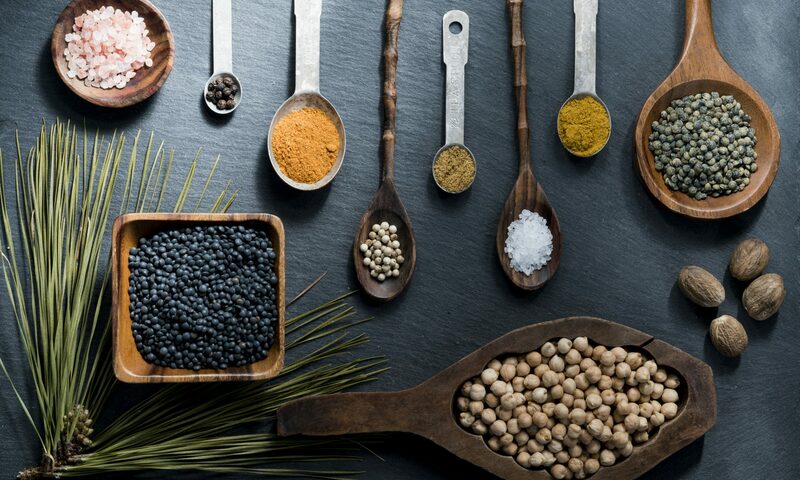 There’s nothing wrong with carbs, and of course, they’re necessary for glucose-dependent activities such as hiking, but glucose (carbs) is a quick-burning fuel. Adding fat and protein to meals slows down digestion and creates slower-burning, longer lasting, more stable energy. Adding fat and protein to pretty much everything I eat balances blood sugar and helps me have stable energy all day. 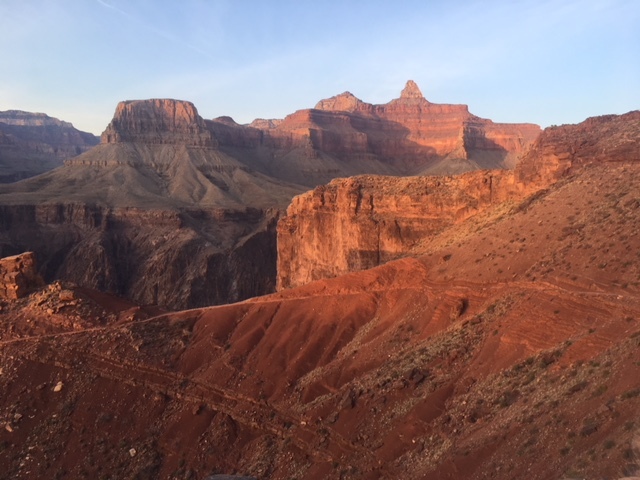 In an effort to postpone getting into too much of a calorie deficit, I had a protein bar after I reached the river, while walking through the canyon. Food would be easier to digest during easy walking. Our bodies only process about 200-300 calories per hour, so I try to eat throughout the day, so I can keep moving, as opposed to eating a lot at once. Right before beginning the climb to the North Rim, I wanted to take in a decent amount of carbs to fuel me, so I had a banana and chips. I also knew I’d be in the sun and beginning to sweat a lot, which is why I chose a salty snack. The potassium from the banana was also helpful for mineral balance while sweating. About 2 miles from the North Rim, it was getting hot and I was hitting a wall, so I had a couple of date bites, which are high carb, but with a little fat and protein. At the rim, I took a short break for some chips and almond butter to replenish some salt, and because it’s my favorite trail snack. I also wanted the carbs and fat to fuel me on the way down. Back at the bottom, walking along the river, I was beginning to get tired, so I had another bar and a date bite to keep me moving. My last snack was before crossing the river, heading back up to South Rim. I chose caffeine chocolate to give me an extra boost on the 5,000′ climb, chips for the salt and carbs, and almond butter for the fat to fuel the last 7 miles. I probably should’ve snacked again on some carbs a couple miles before the end because I was definitely hitting a wall, but I pushed on instead. I made sure to drink a lot of water throughout the day, especially at sources, where I would ‘camel up’. I added Nuun tabs to replenish electrolytes lost through sweat. Whatever your adventure, whether long or short, hopefully this provided some insight into how I think about maintaining energy for a long day outdoors. If you want more ideas on fueling for endurance, check out my free ebook here. I found this article super helpful! I loved reading and seeing the photos of what you ate on an intense day-hike. Thanks to your article I tried the Primal Kitchen Collagen bars. My mom liked the coconut one and I tried the chocolate hazelnut flavor. I think mine had expired because it tasted rancid. But mom loved her bar, so I’ll give them another try. I almost daily drink collagen shakes, so I love the idea of having a collagen bar. I’m obsessive over my gear and keeping weight down. This love for numbers is now including the food that I pack in. I want to feel as great as I can while I’m out on my adventures. Thanks for sharing! Thanks for the feedback, Elizabeth! So glad you found this helpful!